メインギャラリー: National symbols of Afghanistan. U.S. Secretary of State Hillary Clinton standing with Afghan female politicians. John Kerry with Abdullah Abdullah and Ashraf Ghani in July 2014. The Medes followed by the Achaemenids ruled the area until 330 BC. 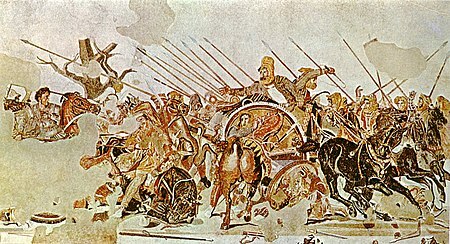 Alexander the Great explored the land in 330 BCE after defeating the Achaemenids. Afghanistan became part of the Maurya Empire, which brought religions of India such as Jainism, Hinduism and Buddhism. Islam arrived to Afghanistan in the 7th century through what is now Iran. The Saffarid Empire was established in 861 with its capital at Zaranj, Afghanistan. The Ghaznavid Empire was established in 975 with its capital at Ghazni, Afghanistan. The Ghurid Empire was founded in 1148 at Ghor, Afghanistan. Humayun and Babur of Kabul. From their power base in Afghanistan, they crossed the Indus River and conquered the Punjab region followed by northern India, establishing the Mughal Empire. Babur is buried in Kabul. The Hotak Empire was established in 1709 with its capital at Kandahar, Afghanistan. Ahmad Shah Durrani established the Durrani Empire in 1747 with Kandahar, Afghanistan, serving as its main capital. British India's invasions and withdrawls in the 1800s.